What Does It Take To Dismantle Workplace Barriers for Transgender & Nonbinary Workers? 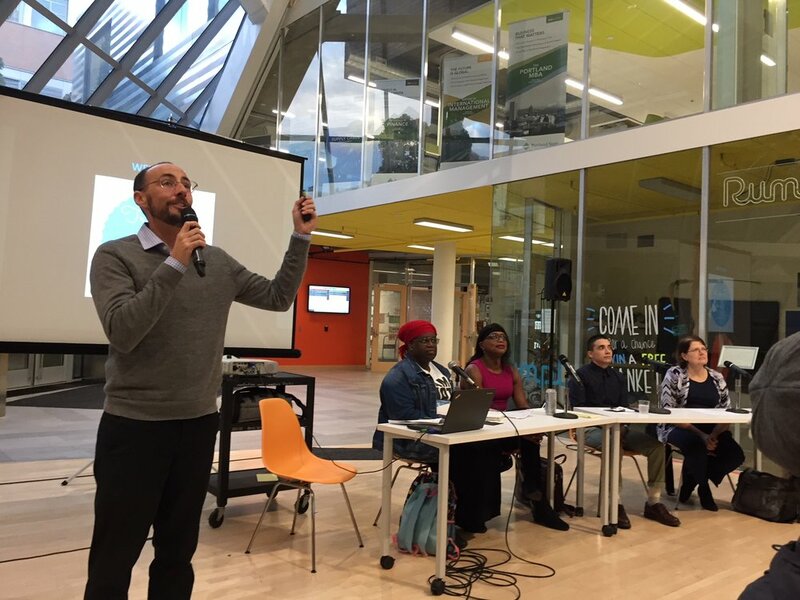 In honor of the 2018 celebration of National Coming Out Day, I had the honor of moderating a panel discussion about dismantling workplace barriers for transgender and non-binary (TNB) people at Portland State University’s School of Business. The event was organized for participants interested in learning more about the workplace barriers TNB people in the Portland Metropolitan Area endure, and how community members can help dismantle them. Students, business leaders, elected officials, and government executives all showed up to the event to gain new knowledge, skills, and support in being a part of a community effort to expand economic opportunities for TNB people. The program shared findings from a TNB community listening session my firm hosted in April. Why was a community listening session organized? Prior to this event, participants had the opportunity to review the summary report featuring findings from the Portland TNB community listening session. The report offered context for why the listening session was held, and efforts community organizations like the PABA - Portland’s LGBTQ Chamber of Commerce - are doing to expand economic opportunities for TNB people. While Oregon is known for its progressive human and civil rights laws, these laws alone have failed to eradicate the harsh realities many TNB Oregonians endure in the workplace. Tragically these Oregonian’s experiences are not unique. The disproportionately higher rates of poverty, unemployment, and mistreatment on the job are similar for the 1.4 million TNB people living across the United States, and these statistics become even more dismal when considering the compounding barriers TNB people of color, immigrants, women, non-binary people, and differently abled people endure. While Portland is the 26th largest municipality in the United States, it is the seventh largest when it comes to TNB people calling the area home. Given this reality, progressive leaders in the City, at the County level, and across the State of Oregon – including those of us within the LGBTQ Chamber of Commerce – have a responsibility and an incredible opportunity to build upon the leadership of other major West Coast cities sharing economic empowerment opportunities with some of the most vulnerable TNB community members. Part of this work starts with stakeholder education like last week’s panel discussion. How are we educating stakeholders? Access to leadership opportunities, including mentorship programs, advisory board opportunities, and peer support networks designed by and for TNB people with careful consideration these opportunities are welcoming for TNB people of color. Design culturally specific entrepreneur & employment programs to help address the prolonged trauma of poverty endured from un/underemployment. Ensure that approaches are centered at the margins, recognizing that the impacts of workplace barriers get compounded for TNB people of color, immigrants, women, non-binary, differently abled, and those engaged in underground economies. Build a stronger local TNB movement where funders invest in a strong network of TNB-led organizations coordinated to meet the significant economic needs of those at the margins. There was recognition that this kind of movement building was lacking in Portland. Strengthen the collective responses to job insecurity by working across social justice coalitions to strengthening community responses to job insecurity and the impacts of poverty. The panelists who spoke last week unpacked some of these community informed recommendations by sharing their unique perspective on existing workplace barriers for TNB people, and actions they are taking to help dismantle them. We were so fortunate that many folks in-and-around Portland joined us for this critical conversation, and many left with concrete strategies on how they can help create more welcoming workplaces for our fellow transgender and non-binary friends and family. Read the Report. Continue to self educate by reviewing findings from the TNB community listening session hosted in April. Share Feedback. Take a few moments and fill out our panel discussion evaluation form here to help organizers improve community stakeholder education events. Hold Us Accountable. Please contact me if you are transgender or non-binary, or if you know of local folks who are, and have the interest, energy, and time in joining PABA's Transgender & Non-binary Business Advisory Council. Our first meeting will be hosted on Tuesday, November 6 at 6 pm. While the workplace barriers impacting transgender and non-binary people are significant, we believe that our efforts to begin expanding employment and entrepreneurship opportunities will help to dismantle them. If you are interested in supporting this work, please contact me, and let’s schedule a time to discuss what’s possible.